Did you know the way we design our cities can affect our environment? Did you know you can wear a climate solution? Did you know climate change is a social justice problem? 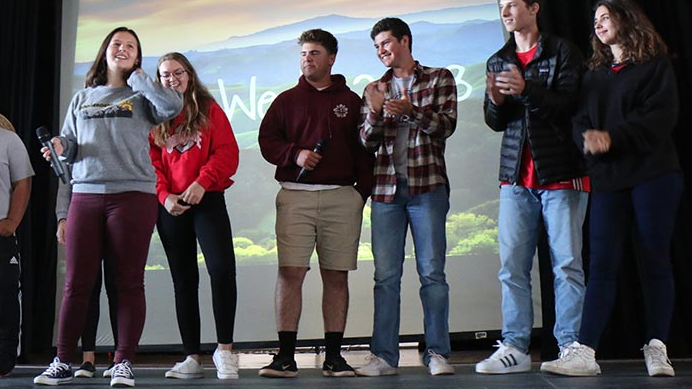 Guest speakers at the Earth Week Assembly, held on April 26, talked about environmental and social justice solutions to big problems, highlighting a week filled with sustainability education and fun activities organized by student Eco Leaders. 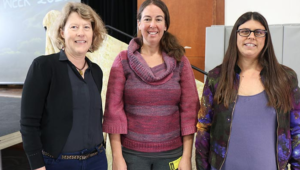 The speakers included Kirstin Miller, Executive Director of EcoCity Builders; Rebecca Burgess, Executive Director of Fibershed and Chair of the Board for Carbon Cycle Institute; and Haleh Zandi, Co-Founder and the Educational Director of Planting Justice. Miller explained that EcoCity Builders, in existence for over 25 years and based in Oakland, focuses on reshaping cities for the long-term health of human and natural systems. “The way that we build and live right now is primarily based on burning tons of fossil fuels, which is changing our climate and which is impacting all of the other ecosystems that our lives ultimately depend on,” she said. Fibershed develops regional and regenerative fiber systems that build soil and protect the health of the biosphere, Burgess said. This project began when Burgess committed to develop and wear a prototype wardrobe whose dyes, fibers and labor were sourced from a region no larger than 150 miles from her front door. She teamed up with a group of farmers and artisans to build the wardrobe by hand, and illuminate that regionally grown fibers, natural dyes, and local talent was still in great enough existence to provide this most basic human necessity – our clothes. The project ultimately became a movement. At Oakland-based Planting Justice, Zandi works to empower people impacted by mass incarceration and other social inequalities with the skills and resources to cultivate food sovereignty, economic justice and community healing. The organization’s educational program assists people most directly impacted by poverty and food injustice to create a more local sustainable food system by developing their skills in permaculture design, nutrition education, and multimedia arts that ground and connect urban gardens with local and international struggles and movements for social justice.